I just recently became an uncle. My brother and his wife welcomed their first baby into the family. Problem is all that has happened several thousand miles away, in Lebanon. It is customary to buy a ton of candies and sweets to offer the visitors and well-wishers when a baby is born. It’s also customary to make “Meghli”, a pudding made from rice flour, sugar and spices. The word meghli means boiled. Not sure why this particular pudding got the name as opposed to a myriad of other similar ones that are also “boiled”. 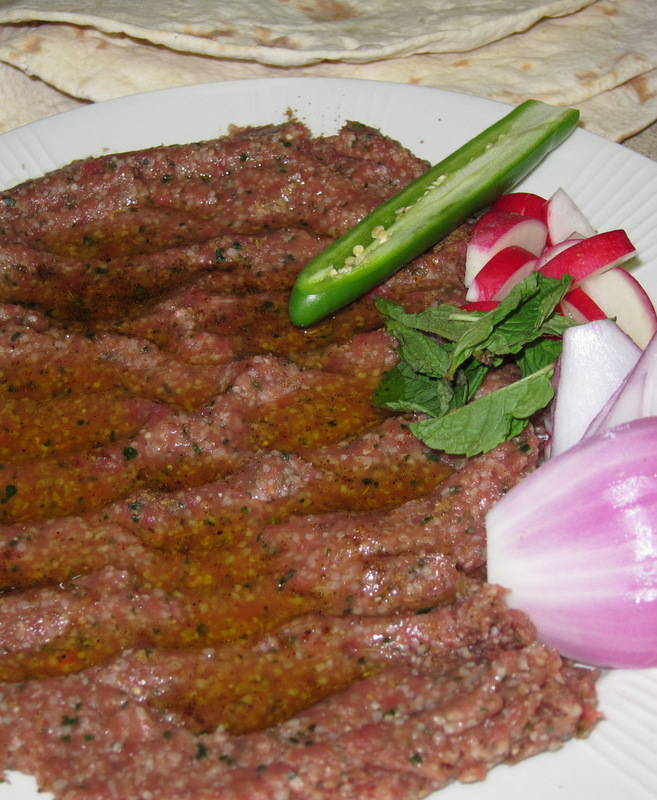 In any case, it is a delicious taste of childhood for me and just because I am not in Beirut with them it does not mean I cannot make me some Meghli and enjoy it. So, I called mom and asked her for her recipe. She was nice enough to send it via Facebook in what I call “Anglish”, Arabic but using English letters. It cracks me up how good she is at it. At the end of the post is my proper adaptation for it. It is very simple. A mixture of sugar, water, rice flour, caraway, cinnamon and anise is boiled till thick. It is allowed to set in the fridge. 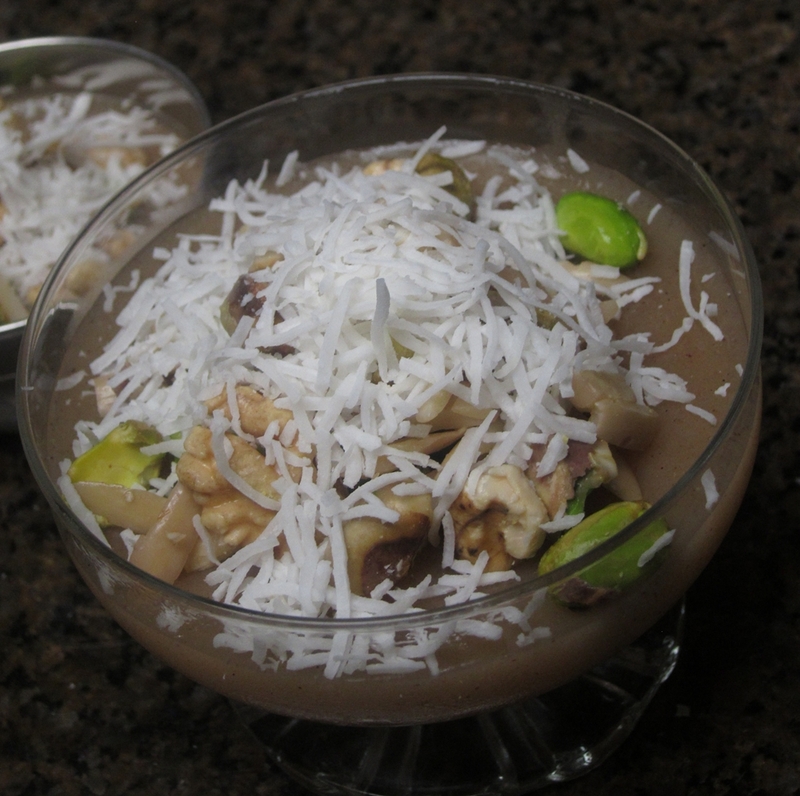 Then it is served topped with a good helping of raw nuts and coconut shreds. The nuts have to be soaked for several hours in water so they get a nice fresh crunch that goes so well with the soft spiced pudding. I’ve tried it with toasted nuts before and for some reason I do not think it works or taste right. It just lacks a refreshing component somehow. 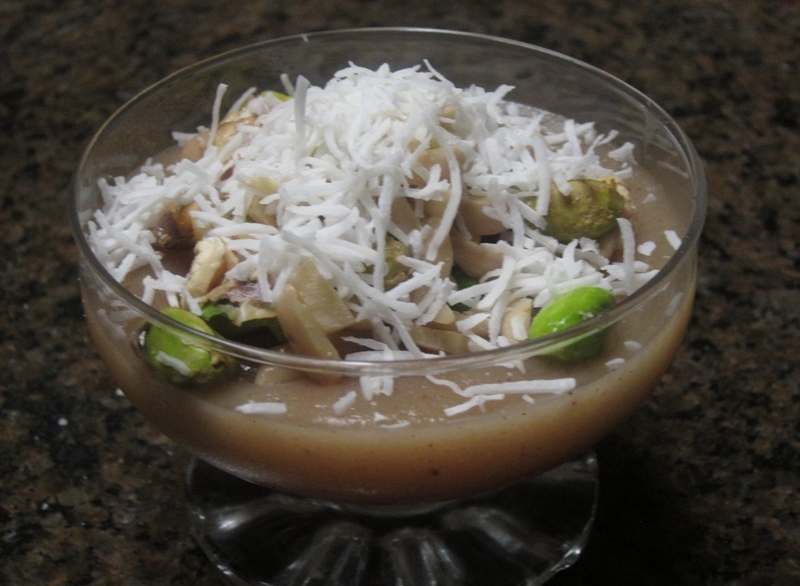 Combine all the ingredients for the pudding and bring them to a simmer. Stir the mixture until it thickens. Divide the pudding into small cups or ramekins and chill it. Now is the time to soak the nuts in water and keep them refrigerated until ready to serve. To serve it, just drain a handful or so of nuts and top the pudding with it. Sprinkle with coconut and enjoy. 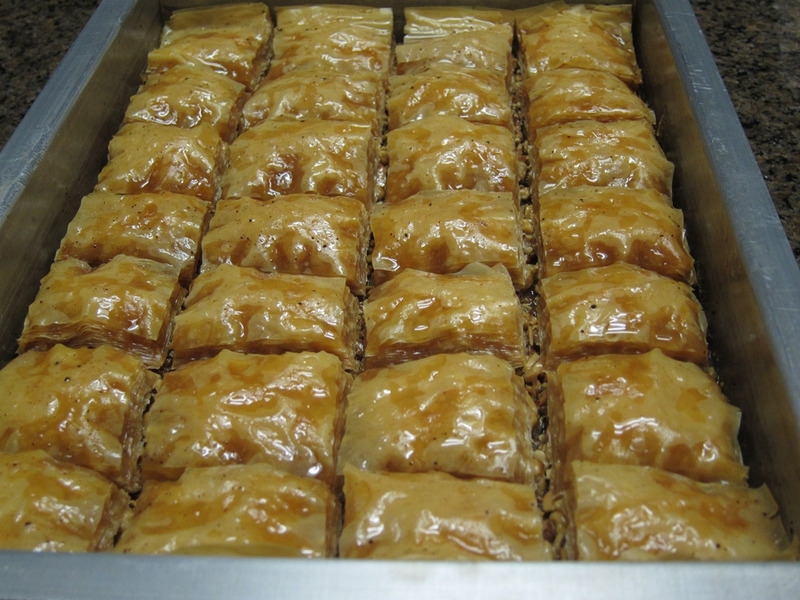 All of the Baklawa (or Baklava) versions are made with filo, a nut filling and a sweet syrup. 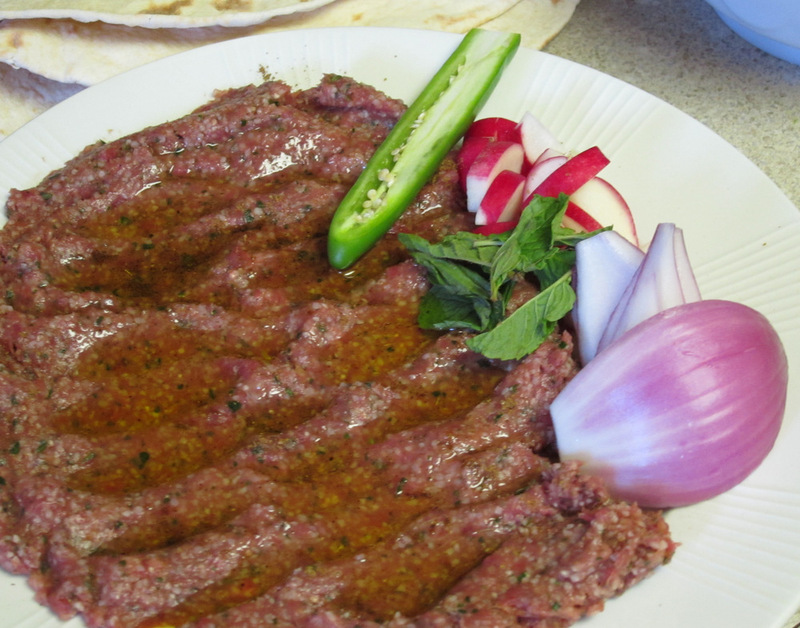 However, what makes Lebanese Baklawa different than Greek or Turkish ones and – in my biased opinion 🙂 – better, are a few details. There should be no spice in the nut filling. No cinnamon, no cloves, no mace or nutmeg. The filling is just nuts, a little sugar and a pinch of salt. That’s all. Spices just distract from the flavor of the roasted nuts. 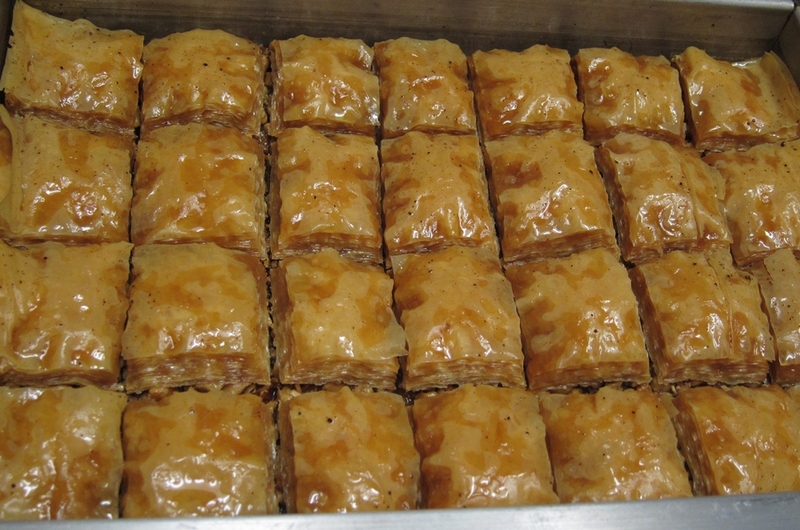 Lebanese Baklawa also does not have honey. No honey at all. Honey syrup makes it heavy and a bit cloying and again imparts its own flavor. This Baklawa is soaked in a syrup made from water, sugar and a couple of aromatic extracts namely rose water and orange blossom water. The first one is distilled from a specific kind of rose that is usually pink, not much to look at but so fragrant. The second one is distilled from the blossoms (flowers) of orange, preferably bitter (Seville) oranges. Last but not least, there are only two layers of filo in a Baklawa. This is not a club sandwich. The construction should look like this: filo+nuts+filo. I’ve seen many versions that are more like filo+nuts+filo+nuts+filo. Not so good. Mix the nuts with the sugar and salt set aside. Generously brush a 9 by 13 inch baking dish with some of the butter. 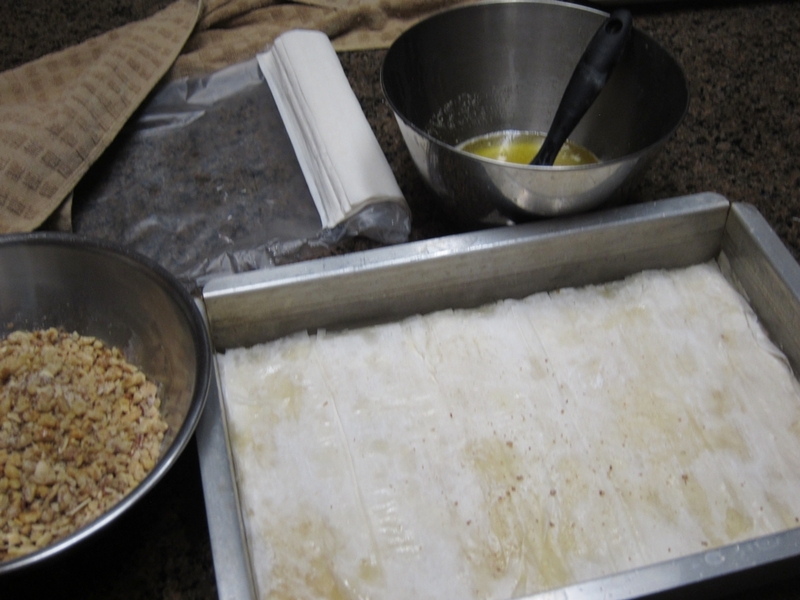 Lay half the filo sheets in the pan brushing each one with clarified butter as you put it in the pan. Spread the nuts mixture on the filo sheets and lay the rest of the filo on top, again brushing each one with the butter. Preheat the oven to 350F. 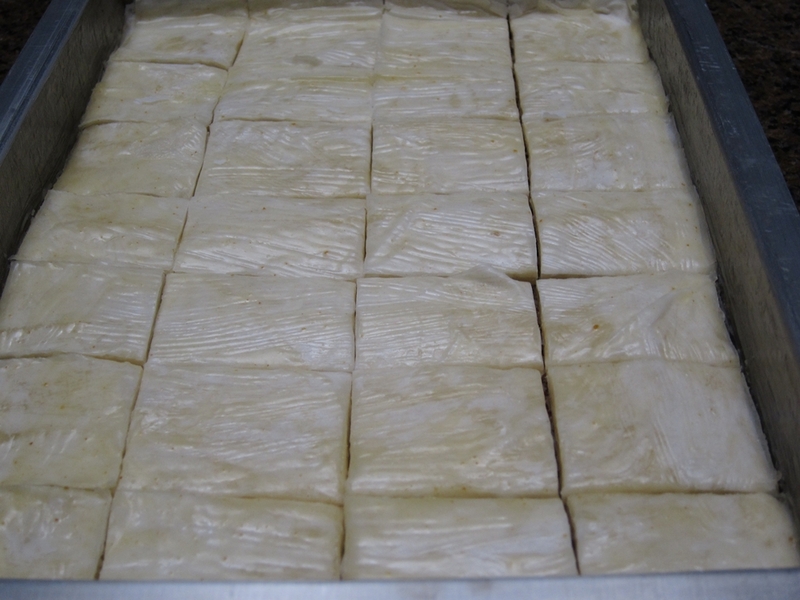 With a sharp knife cut the baklawa while in the pan into squares of about 2 inches. Place the pan in the oven and reduce the temperature to 300F. Bake it for about an hour, or until a nice golden color and puffed a little bit. While the baklawa bakes make the syrup by boiling the water, sugar and lemon juice together for about 4 minutes. Turn off the heat and add the rosewater and orange blossom water. Let it cool slightly (this can be done a few days ahead and kept well covered at room temperature). When the baklawa is out of the oven, pour on the syrup and allow it to soak through. Let it cool to room temperature and enjoy. 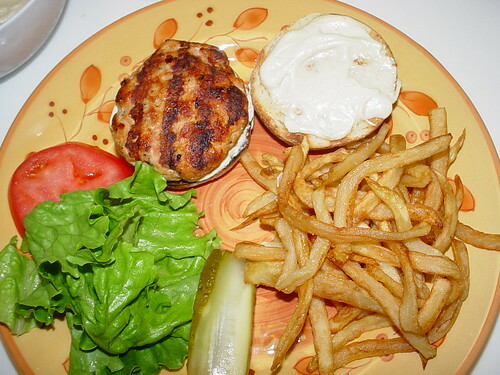 This is my absolute favorite chicken burger recipe. Diana requests it almost every time I ask her what she would like to eat off the grill. 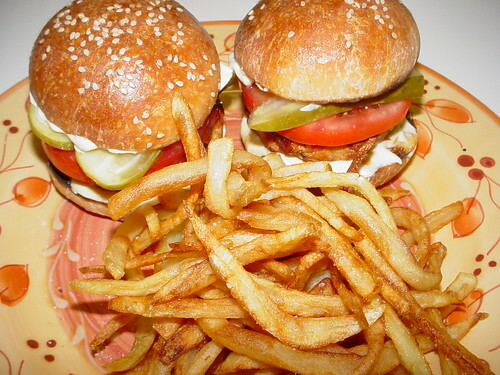 I first created this recipe for some ‘Best Burger’ contest. I did not win, but since then this beauty is a winner every time I make it for friends. The origin for the recipe is the Lebanese dish Shish Tawook which is chicken chunks marinated and grilled on skewers. The aioli that goes with the burger is inspired by Hummus bil Tahini better known in the US as ‘Hummus’ dip. I usually also make my own buns but store bought Kaiser buns are perfectly fine. Some of the marinade prep. Marinating the chicken. Note how I leave some fat on the meat. 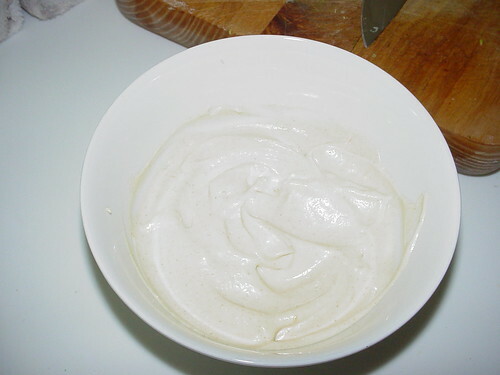 Creamy -and very addictive- Hummus Aioli. Tastes great on the burger and with fries. Grilling over charcoal is the best way to go. …but I usually eat at least two with lots of homemade fries. These buns are home baked too. Now, here’s the recipe. Give it a try. 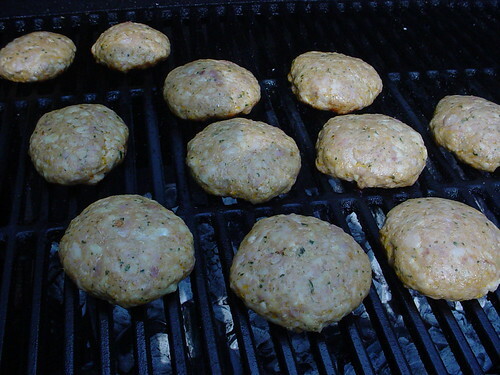 4 to 24 hours before you want to enjoy these burgers marinate the chicken. Combine all the burgers’ ingredients except for the chicken and crumbs in the bowl of a food processor or a blender and pulverize to a paste. I like to do that with a granite mortar and pestle instead, but a processor works fine. 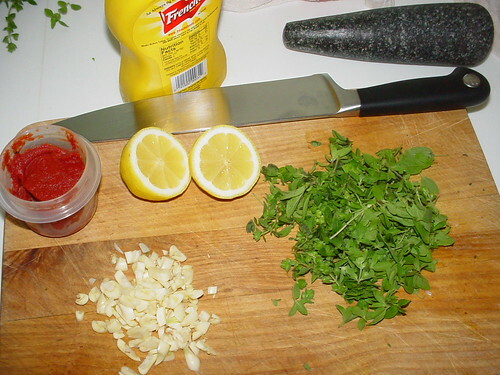 Season the marinade with salt and pepper. Be a bit aggressive since this is the chicken’s seasoning. 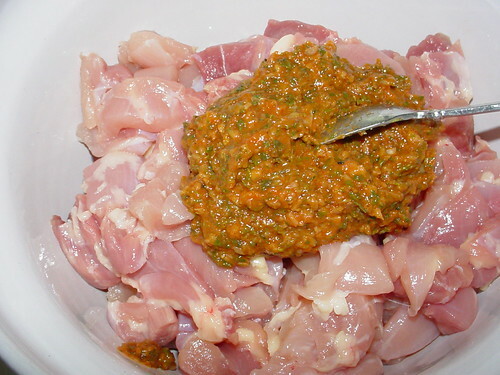 Place the marinade and the chicken in a bowl or Ziploc bag, mix well and refrigerate till you are ready to use. 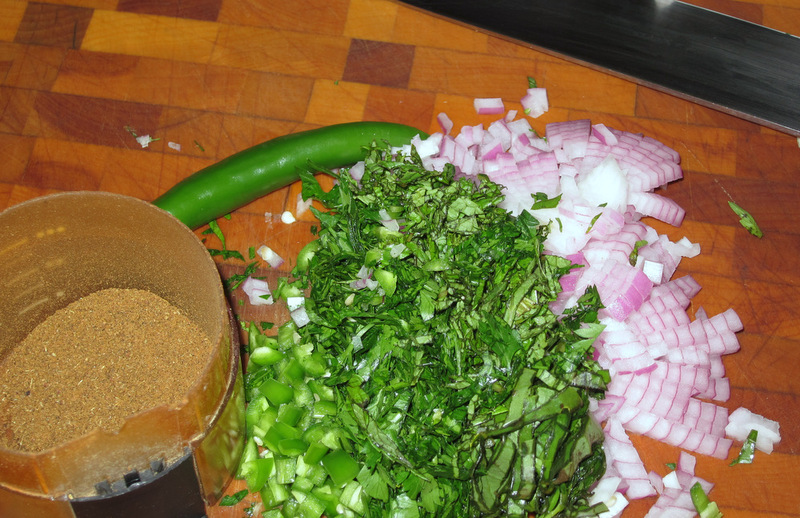 When you are ready to make the patties, place the chicken and any marinade stuck to it in a food processor and pulse till the chicken is finely chopped but not creamed. Place the chicken in a bowl and add the crumbs and mix well. 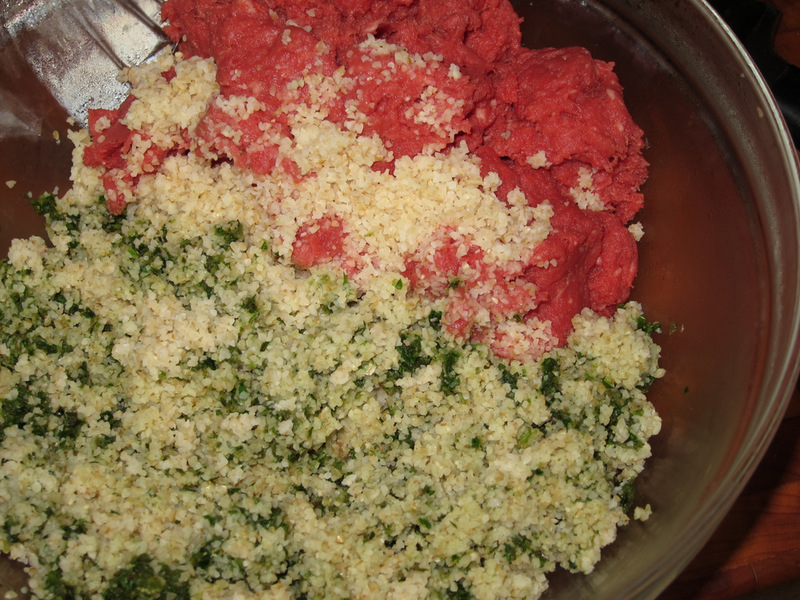 Form the mixture into 10 or 12 (depending how much you trimmed the meat) 4 oz patties. Oiling your hands helps with this process. Grill them over charcoal or if all else fails, under the broiler. 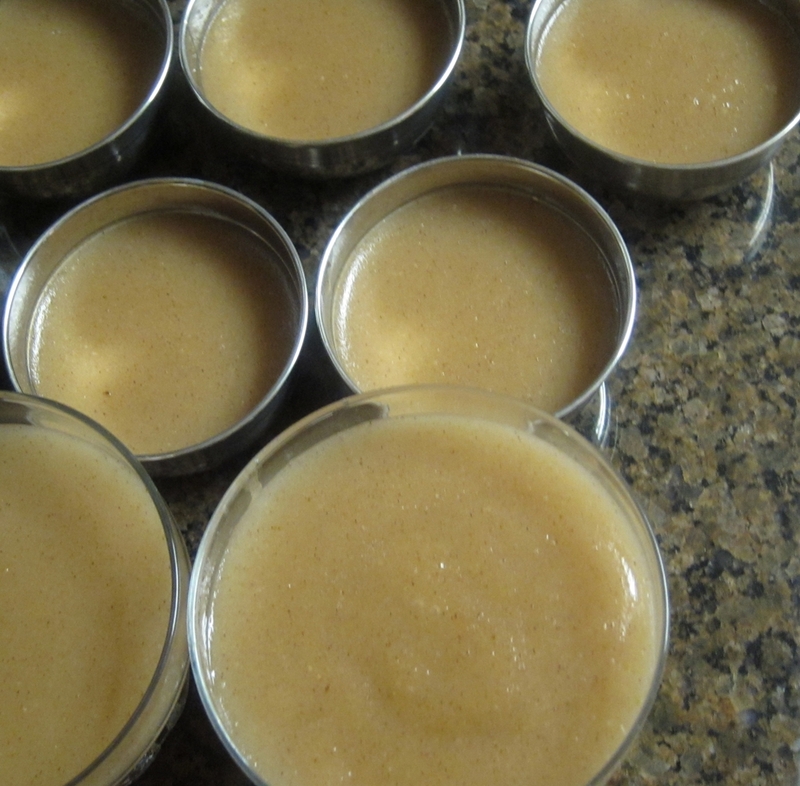 The Aioli can be made hours or even a day or two ahead of time. 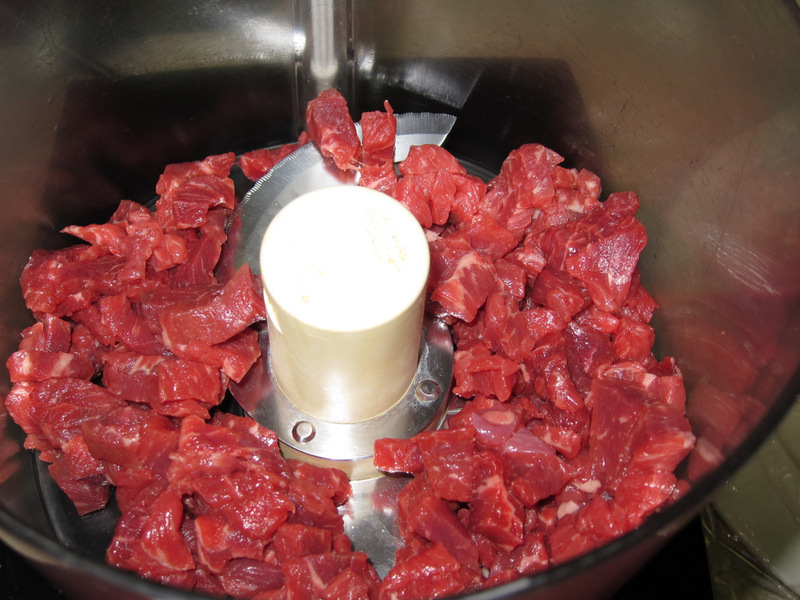 In a blender combine everything except the oil and puree till smooth. With the blender running, drizzle the oil in a VERY THIN stream. The end result should look very much like a slightly grainy mayonnaise. Well, that’s what this is. Season with salt and pepper. 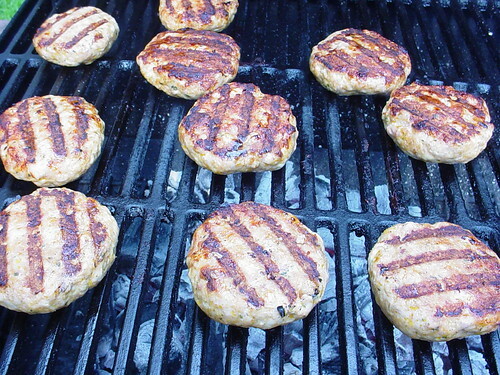 To serve, lightly grill the buns, slather generously with the aioli on both sides and add the patty. Top with your favorite garnishes and serve with a side of fries. A small ramekin of extra aioli goes great with the fries too.